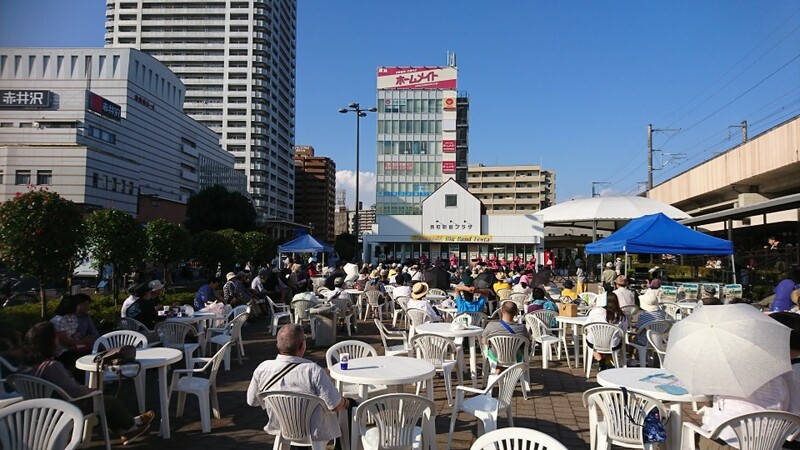 The coming of autumn in Sendai seems to inspire not just sweater weather and a chill in the air but also a need for music festivals, outdoor and frequently free. 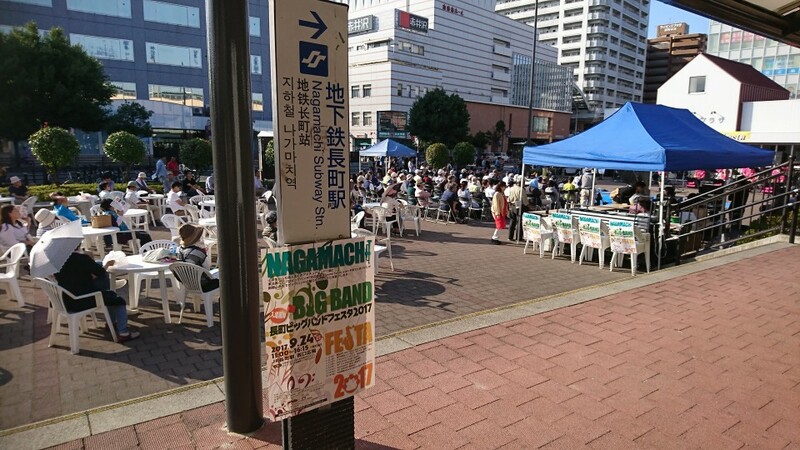 The Nagamachi Big Band Festa was one such festival held late last month. 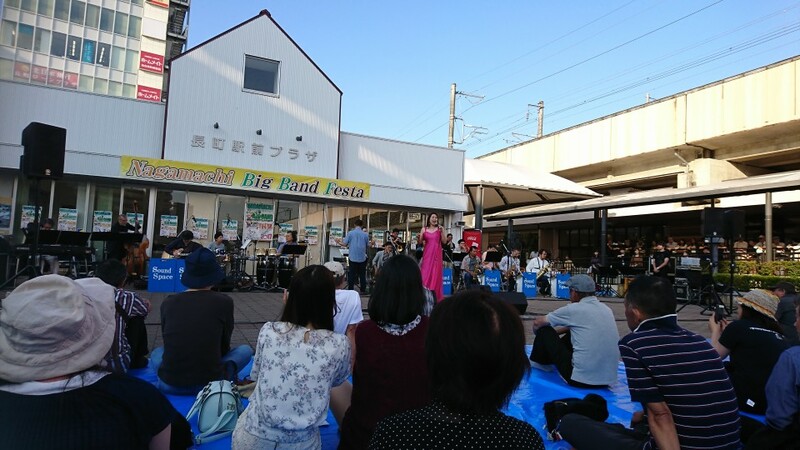 Over the course of five hours or so, eight separate groups took a stage set up just outside of JR's Nagamachi Station, just five minutes from Sendai. Due in equal parts to a faulty memory and misinformation, our party arrived towards the back end of the festivities. Anyone coming to similar events in the future should remember that The Mall at Nagamachi is not at the JR station but at a subway station a few stops down. Concerts are rare at the station, but even more so at the mall. Upon our belated arrival, there were seats open at tables to the back of the perfomance space as well as a few options scattered in amongst the small audience seated in fold-up chairs in the middle of the viewing area. Up front, two large blue leisure sheets were taped down for those who prefer to ditch the footwear and recline while taking in the show. As this space was mostly unused, we chose the leisure sheets for our own viewing experience, which turned out to be the best choice given the natural rambunctiousness of our young daughter. From what we heard of Jet Horns, they seemed highly enjoyable and fun, even for the casual listener of big band music. 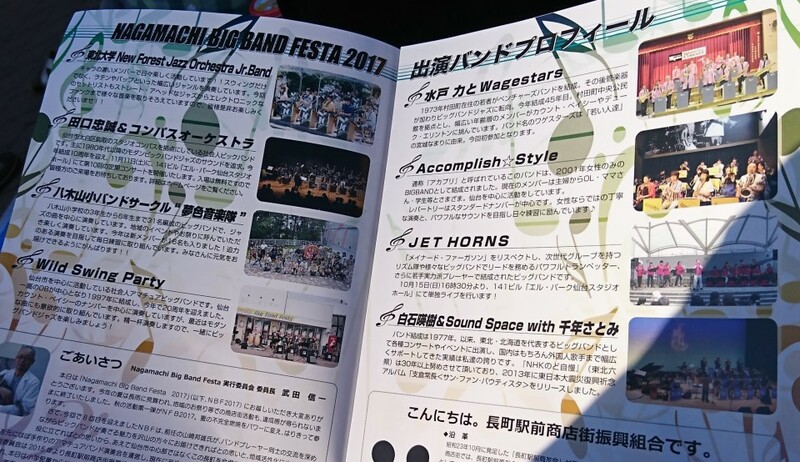 The list of bands to perform on the day started off with the Tohoku Daigaku New Forest Jazz Orchestra Junior Band, which unfortunately led many would-be spectators, including my husband, to be reluctant about going at all. While the band did play early and this festival goer did not get to see them, giving events like this a chance is something to be encouraged, even if some of the bands may not be of a professional quality. By the time the last band left the stage, even my reluctant viewing companion was genuinely glad to have come. The last band of the day was really something special. From the opening chords of the first few instrumental tracks to their inclusion of the jazz stylings of Sennen Satomi, the band put on a great show. People filed into any available chairs, many standing on the street-side. A couple even began dancing lightly to the music just off to the side of the stage near the sidewalk. Around us on the leisure sheets, more and more people found their way out of their shoes and onto the tarps. By a few songs in, we were all clapping along with the beat or nodding and swaying with the music. Bringing together music of this generation in a free live performance seems a genius way to get the various age groups and social classes out for a little fun on a Sunday afternoon. Despite not being major fans of the big band genre, every member of our group who attended enjoyed the show immensely, to the point of participating as much as we could in the songs as they progressed from old jazz favorites to a rendition of the Whitney Houston Classic "I Will Always Love You", of which I must say that this live version was definitely a personal favorite. The people of Tohoku should look forward to more events like these.